Electrochemical interfaces can be studied using electrochemical methods such as voltammetry, impedance and among others. The answers obtained are interpreted in the context of a variety of models that describe the interface which take the average values measured and try to interpret the changes on the surface. Alternative and complementary methods are needed, and combining spectroscopic methods with electrochemistry has proved to be very useful. In our work, we use fluorescence microscopy as an in-situ methods that tells us about the changes in the interface due to changes in the interface, specifically interfaces that are modified by organic molecules. 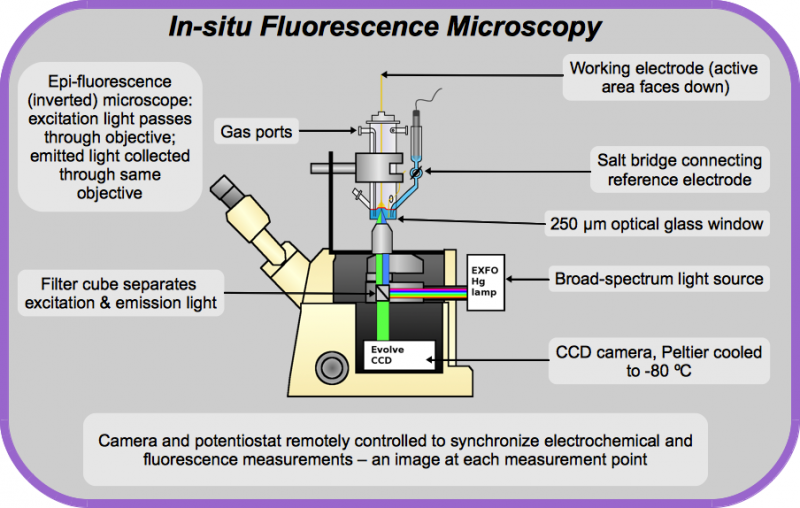 Designing in-situ fluorescence microscopic analysis of electrochemical interfaces requires a specifically designed electrochemical cell. Our glassblower has created a spectroelectrochemical cell with a 0.25mm window through which the electrochemical interface is observed. We position this electrochemical cell on top of an epi-fluorescence microscope, equipped with a long working distance objective (50X, NA 0.55). The illuminating light, of a particular wavelength is focussed onto the electrode surface, and the resulting fluorescence is collected by the same objective and filtered, then sent to a CCD camera for collection. The fluorescence observed is strongly dependent upon the distance that separates the fluorophore from the metal electrode. We adsorb lipid-like molecules onto the metal surface that include a small amount of fluorophore or create self-assembled monolayers (SAMs) that are modified with a fluorophore. Cycling the potential negatively changes the surface energy of the interface. The adsorbed molecules are either displaced from the surface via competative adsorption of water, or via reductive desorption of the Au-S bond in the case of SAMs. In either case, the fluorescence increases and the strucutre of the adsorbed layer is revealled. In contrast to the average picture of these types of surfaces, we see significant heterogeneity in even SAMs, something not typically displayed in the cartoons seen in publications.